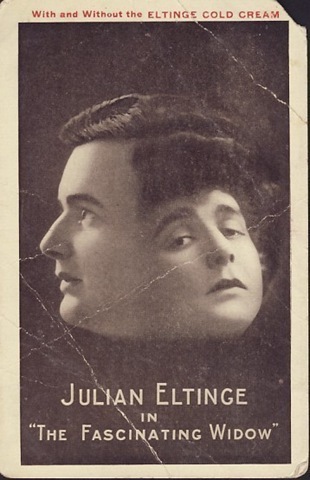 This rather bedraggled postcard of Julian Eltinge in “The Fascinating Widow” has been listed on EBay. Hm. Eltinge Cold Cream is a new one on me. Eltinge was one of the most famous female impersonators of his day and built a large house at 2328 Baxter St. in Silver Lake. Bidding starts at $7.99. This entry was posted in Found on EBay, Hollywood, Lesbian, Gay, Bisexual, Transgender, Stage and tagged #EBay, #Julian Eltinge. Bookmark the permalink.